Playing with Chipmunk Basic is a decent way to learn about programming. Most of this content is now mirrored at https://github.com/anoved/Chipmunk-Basic-Stuff. Edit your Chipmunk Basic code in style with these syntax coloring extensions for a variety of excellent text editors. “Syntax coloring” draws recognized language commands and control statements in different colors. These extensions do not recognize many elements of the Chipmunk Basic language (such as most of the Mac-specific capabilities described in the Quick Reference). Consider these extensions a starting point that you can add to and improve as needed. Rudimentary syntax module for TextWrangler 2.2 or BBEdit 8.5. Put the plist file in your ~/Library/Application Support/TextWrangler/Language Modules folder. Named subroutines are listed in the function popup menu. Syntax pattern recognition configuration for the X11 text editor NEdit (roll your own?). Save and integrate with your NEdit configuration file using the command nedit -import cbasne.nedit, then select Save Defaults from the Preferences menu. 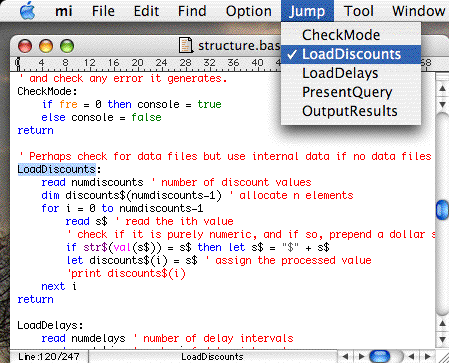 Chipmunk Basic syntax mode for the text editor Mi. Put the expanded folder in your ~/Library/Preferences/mi/mode/ folder. Recognizes files, basic keywords, named subroutines and gosub labels. Note: These notes are based on an old version of Chipmunk Basic. This statement lets you navigate around an open file. FNUM should be an open file; the file position marker is moved to byte number POS (where 0 is the first byte in the file). I don’t know if there is a way to determine the total length of a file without reading through it until it hits eof. I do not think fseek accepts any aditional arguments, such as a “seek set” value indicating where to seek from, so POS is always relative to the beginning of the file. This can be used for more “random” file access than is possible with the open "filename" for random as # construct, which is really most useful with a regular record format. With fseek you can “fast forward” or “rewind” through a file by an arbitrary number of bytes. Copyright 1994 Ronald H. Nicholson, Jr.
You can include code with the merge statement. Chipmunk Basic has a merge command which loads the specified program file’s lines into memory. Unlike the load command, the current program, if any, is not closed before merging. This allows code from multiple files to be loaded simultaneously. merge can be used from the Chipmunk Basic command line to combine code from two files, but it can also be used within a program to embed code from another file! Lines from the merged file are inserted into the current file according to line number. If you write code using line numbers, be careful to anticipate this, or else lines from the merged file may overwrite lines in the current file. Otherwise, merged code is appended to the end of the current file. In other words, if all the code is unnumbered, merged files are numbered starting at the end of the sequence used for the parent file. Here is an example of a short cbas program that counts and displays any arguments that are passed to it on the command line. This program illustrates use of the #cbas#run_only directive and the argv$ string. 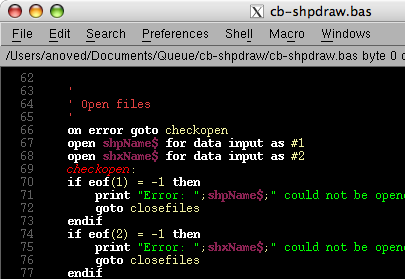 The #!/usr/bin/basic line tells the shell what program to use to interpret the rest of the file, and the #cbas#run_only line directs the interpreter to quit once the program is finished running. Giving field$ negative one as a field index causes it to return an arbitrary string with a length corresponding to the number of field separators (space by default) in its input. Chipmunk Basic appears to append an additional space to the argv$ string. This means that len(field$(argv$,-1)) returns the number of real fields (arguments) in argv$, which is reduced by two in the example above to ignore the ever-present interpreter and program name arguments. called, but that may not always be what you’re looking for). At any rate, it is a powerful function. printed by ls. This all happens without exiting the basic interpreter; notice that the prompt is still the basic prompt after the shell commands have been executed. This illustrates how other programs can be called from within cbas. You could even write specific components of a cbas project in a different language, and encode return information in the exit status of those sub-programs.